Where the Sphere of Domesticity is Fired Up! And the Memory Hole Gets Stopped Up! Although the women of the United States are confined within the narrow circle of domestic life, and their situation is, in some respects, one of extreme dependence, I have nowhere seen woman occupying a loftier position; and if I were asked... in which I have spoken of so many important things done by Americans, to what the singular prosperity and growing strength of that people ought mainly to be attributed, I should reply, To the superiority of their women. In case you missed a part of my series blogging Yuri Bezmenov's Love Letter to America, I have for your convenience a listing of those posts along with visual aids! I can't get full-length Google Vid to embed, so here is the link in case you want to watch it like a movie. Here is a more in-depth lecture by Mr. Bezmenov at UCLA. The last part is the best part! we can comfortably be merged with the Soviet Union." With the collapse of the dollar, can you not see how it could be arranged that the one-world government as predicted in the Bible will become necessary to maintain order? The point of this post is showing how the infiltration of a country is an almost scientific operation, carried out in a series of steps. The whole point of demoralization, as Yuri says is to get your target nation so confused so that the population cannot come to a rational conclusion about anything. Do your own diligence to try to cut through all the propaganda you're being fed. Don't ever say something is too far out there to be investigated. If you tried to explain to a child how our country is 14 trillion dollars in debt and the government won't stop spending, they'd say, "no way! that's too far out there!" In 1891, [Cecile] Rhodes organized a secret society with members in a "Circle of Initiates" and an outer circle known as the "Association of Helpers" later organized as the Round Table organization. In 1909-1913, they organized semi-secret groups known as Round Table Groups in the chief British dependencies and the United States. In 1919, they founded the Royal Institute of International Affairs. Similar Institutes of International Affairs were established in the chief British dominions and the United States where it is known as the Council on Foreign Relations. After 1925, the Institute of Pacific Relations was set up in twelve Pacific area countries. They were constantly harping on the lessons to be learned from the failure of the American Revolution and the success of the Canadian federation of 1867 and hoped to federate the various parts of the empire and then confederate the whole with the United Kingdom. ... There does exist and has existed for a generation, an international Anglophile network which operates to some extent in the way the Radical Right believes the Communists act. In fact, this network, which we may identify as the Round Table Groups, has no aversion to cooperating with the Communists, or any other groups, and frequently does so. I know of the operations of this network because I have studied it for twenty years and was permitted for two years, in the early 1960s, to examine its papers and secret records. I have no aversion to it or to most of its aims and have, for much of my life, been close to it and to many of its instruments. I have objected, both in the past and recently, to a few of its policies but in general my chief difference of opinion is that it wishes to remain unknown, and I believe its role in history is significant enough to be known. republican Mother, this is a major work. The list of the 4 stages tell a story by themselves. I'm trying to figure out what stage we are in. I'm guessing Stage 2 and then will re-evaluate after Nov. 2nd. Of course, we have already had a crises, but there is another on the way if we don't get our act together. You are incredible. I can't begin to imagine the hours you put into this. I would also say stage 2 and mark its beginning with the first TARP in 2008 as this was the first major breakdown in the bargaining crisis. The most probably stage 3 crisis will be the dollar collapse. Stages won't play out as clear cut and defined as they appear in the academic representation as they unfold in the real world, in real time. The process of demoralization continues with each new affront by TSA goons. When that lady in the townhall meeting told Obama she is tired of defending him, and asked "is this my new reality" is text book normalization setting in. Yes, this is the new normal. Demoralization will get worse, we we have successive crises (tarp, stimulus, QE1, 2, SnP downgrade, Debt Ceiling increases) into an every increasing destabilized state and people will keep getting used to it. This is true about real life being different than the chart. 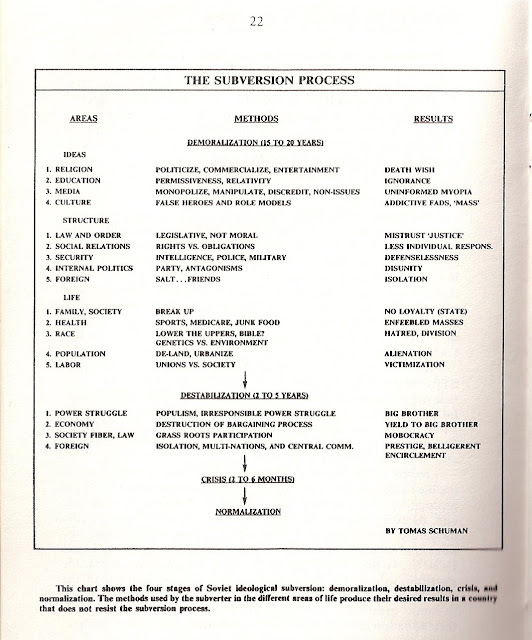 I wrote this a year and half ago and did a more recent post where I said it was time to revisit the subversion chart, because I felt things had changed since I originally wrote this. I guess the normalization Yuri is referring to is the total hammer being dropped, guns in the streets, people disappearing, reign of terror type stuff. This is an excellent compilation of the writen outline of Subversion & including the videos of a TRUE PATRIOT: YURI BEZMENOV. Thank God Yuri was able to provide us with this valuable incite & teaching before he passed. Read these study lessons & re-read them until you are able to FORSEE what will happen in each next step of the subversion plaot. "The real menace of our republic is this invisible government which like a giant octopus sprawls its slimy length over city, state and nation. Like the octopus of real life, it operates under cover of a self created screen....At the head of this octopus are the Rockefeller Standard Oil interests and a small group of powerful banking houses generally referred to as international bankers. The little coterie of powerful international bankers virtually run the United States government for their own selfish purposes. They practically control both political parties." John F. Hylan "Red Mike"
The battle for American independence can only be won with facts. To eliminate freedom, one must first eliminate widespread knowledge of the truth. "The Federal Reserve Bank of New York is eager to enter into close relationship with the Bank for International Settlements.... The conclusion is impossible to escape that the State and Treasury Departments are willing to pool the banking system of Europe and America, setting up a world financial power independent of and above the Government of the United States.... The United States under present conditions will be transformed from the most active of manufacturing nations into a consuming and importing nation with a balance of trade against it." Simple theme. Theme images by billnoll. Powered by Blogger.